Our previous family samplings of Beijing’s artistic offerings have been in the hip and funky/commercialized tourist areas of 798 and Caochangdi. So I wondered how my kids would respond to the more formal setting of the National Art Museum of China (NAMOC). The museum is situated on Wusi Dajie in Dongcheng District, a short walk west from Dongsi subway station on lines 5 and 6. Entrance is free, but you need to show your passport. By law you should of course have this with you at all times, but just in case the helpful ticket office staff will accept a scan of the appropriate page of the document on your phone. The first hall we entered bore the unpromising title of “Beautiful Nature.” No western artist could get away with such a simple agenda; they’d have to dress it up with gobbledygook like “My work explores the relationship between acquired synesthesia and midlife subcultures.” (You can create your own arty nonsense at this site, though the language is not suitable for kids, at least if you’re British and know what that “b word” means…) The actual paintings however were indeed beautiful, discovering intricate form and bright color in the flora and landscapes of China. Over in the west wing the works were less impressive. Although skillfully executed, the dancers and models could have been painted any time since the middle of the twentieth century, the shadows of Picasso and Matisse hanging too heavily. The first floor’s real prize though was a retrospective of the work of Jiangsu-born artist Yuan Yunsheng. The exhibition represents a range of styles and techniques across a long career, but the most striking works were the ink paintings, bringing modern ideas to a traditional Chinese form. There were no exhibitions on the second and fourth floors when we visited, so we headed next for the third, which hosts works donated by the Ludwigs, important collectors of twentieth century art. The paintings on display include two very fine Picassos, and some lively, funny works which may be more to children’s tastes generally. This one reminded us of the cartoon “Adventure TIme”. On the fifth floor was a collection of Russian art. By this stage my boys were flagging, so we rushed through it, though there were some charming portraits and brightly colored fairy tales among the heavy handed social realism. NAMOC is a great choice for a day trip when the AQI is high. 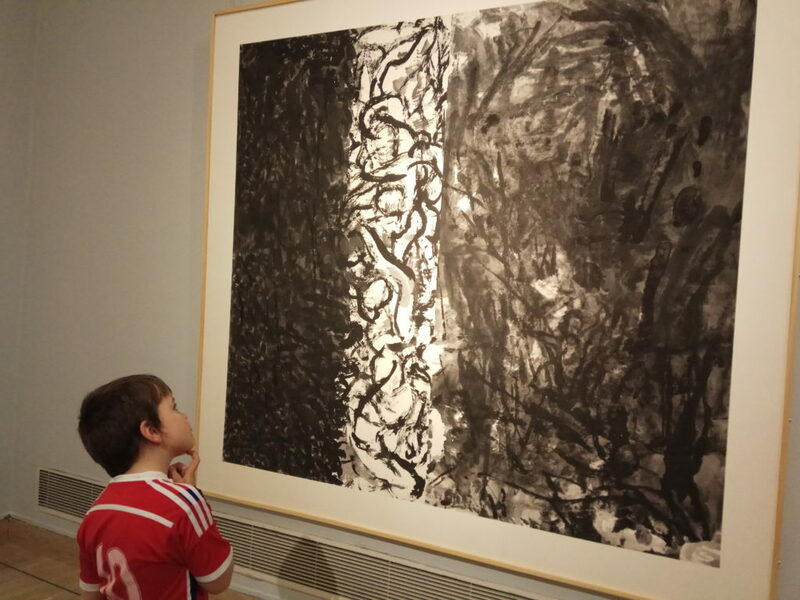 Depending on your kids’ tolerance for art galleries, your visit may need to be a short one, but since it’s free, you can always go back to see what you’ve missed.